Bible Lesson: Jesus told many parables as part of his teaching. One of the most familiar parables is that of the “prodigal” or lost son. After taking his share of his father’s inheritance, this young man spent the inheritance and made a mess of his life. When he finally realized the mistake he had made, he returned home where his father welcomed him with a forgiving and joyful heart. 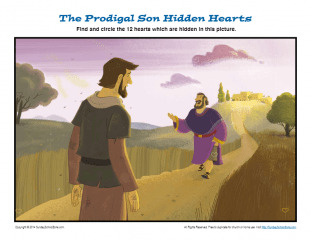 This Prodigal Son hidden picture activity will help kids think about this parable and learn about the love and forgiveness of our heavenly father.